T-Mobile HTC One M9 is receiving the new Android 5.1 OTA update today. The users will get this update via OTA. In case you haven’t received this update till yet, here is the guide which you can follow on your phone and update the same with this latest official update. The process is very simple and takes a few minutes to apply this update on T-Mobile HTC One M9 android smartphone. To apply this update all you need a OTA update zip file and the phone with Stock recovery. If you have the rooted phone with TWRP recovery, then this guide will not work on your phone and you have to go back to the stock recovery to install this OTA android 5.1 update. The below mention tutorial is only for the T-Mobile HTC One M9 users and don’t apply this method on One M9 or M9+ from any other carrier than T-Mobile. Before following this guide, do take the backup of your phone, in case something goes wrong you can restore all your files and data safely. Read all the steps very carefully and follow them step by step on your phone. Step 1. 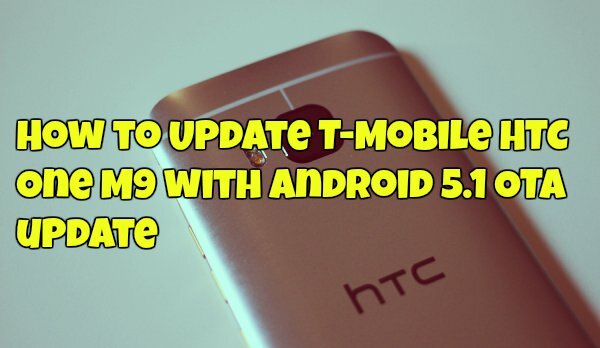 Download the T-Mobile HTC One M9 5.1 update file here and save the file on your desktop. Don’t extract the zip folder. Step 2. Connect your HTC One M9 to PC using the USB cable. And move the zip file on the root folder of your phone. Don’t move it in the folder like download, DCIM or Pictures. Step 3. Now disconnect your phone from the PC and boot in Recovery mode. To do this, Switch Off your phone and press and hold Volume up + Volume down + Power button together until the device vibrates and then release the buttons. You will see a white screen, this is bootloader mode. With the help of power button select the ‘Boot to Recovery Mode’ option. Step 4. Now your phone is in stock recovery mode. From here, select the option ‘apply from phone storage‘. Now, browse through, and select the 5.1 OTA update. The update will start installing. Step 5. Once the installation is finished, Go back to the recovery main menu and select “Reboot System”. Now your phone will reboot and your phone is running on the Android 5.1 update. Check the software version in Settings > About device > Software information. It should be 2.7.531.6. And Android version must be 5.1.